It’s December and Christmas countdowns are in full swing. The Christmas playlist on my Sonos fills every room with familiar noise. Cinnamon and fir tree scented candles and wax melts are working their magic; far more preferable to Loki’s teething nappies! I’ve got a stash of crafty bits and bobs, materials and the like hidden away for quiet wet weeks just like this one. The anticipation of Christmas is always alluring. Christmas crafting activities are practically mandatory in this house. My handy tuff tray keeps most of the mess contained and our beautiful ReSpiin Baskets from Babipur are the perfect size for sensory play. Handy for things into things as they come in 3 different sizes and nestle beautifully together. The colours are rich and vibrant and if you get both sets they make a rainbow – I couldn’t resist! Loki often uses the baskets to transport items around the house, he’ll carry random things into the bathroom when he follows me and uses the bigger ones for nests – they’re great to encourage independent play. He can get what he wants and he learns from experience what will fit in and how he much he can carry. Also they make a great hat! They even come in natural colours, might have to get some more for my bedroom! I set up the baskets with an assortment of natural and man made goodies. Pine cones, cinnamon sticks, star anise all foraged from the park across the road and my kitchen. I also used some sparkly pom poms and tree bark leaves and berries. 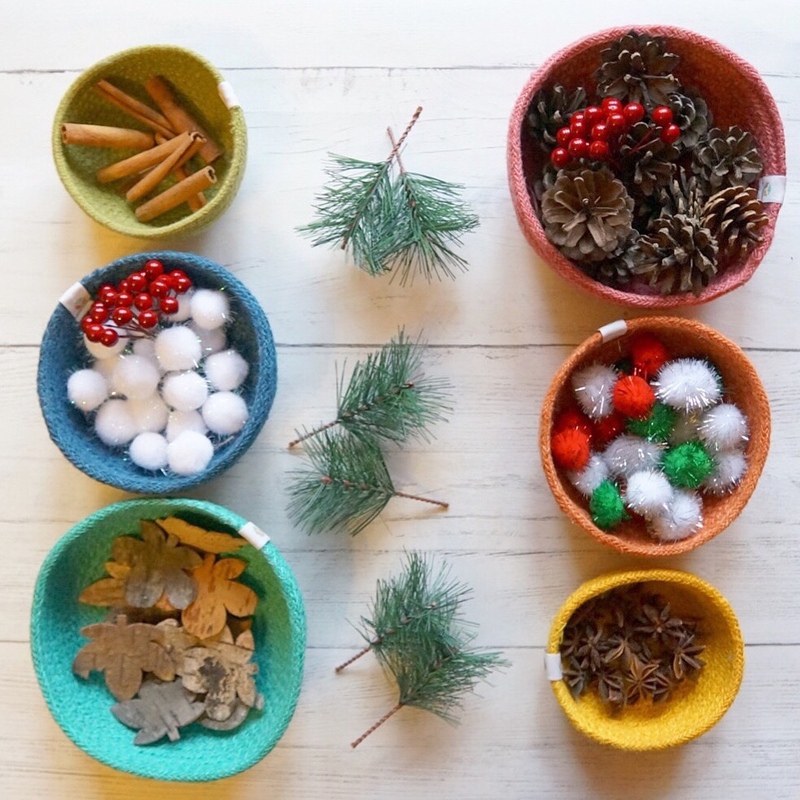 Finally a sprinkling of pine tree stems and job done; Christmas sensory play for the win! Loki got stuck in straight away. Immediately emptied all my neatly organised baskets, trashed the joint and sat looking rather smug amongst the chaos smelling deliciously festive! As he got bored with the mess I added some OkoNorm modelling clay and sat and watched his little fingers explore the different textures and squash various things into it. Loki had a great time. I rolled the clay into little balls and stuck Pom poms and star anise on the top and then he made a “hedgehog” by stabbing a big lump full of cinnamon sticks. Once our session naturally came to an end – a good 90 minutes later I might add – I encouraged him to do some sorting and put things back in their original bowls. It took a few attempts before he got the idea but it worked well. He did occassionally get distracted by something shiny or the dog but soon enough most of the mess was gone. I dusted off the clay from his clothes and tidied the baskets away. Job done! I really enjoy incorporating themed activities into play sessions and Christmas offers so much! I’m now off to find bird seed so I can do fat balls with the older two! *You can find a huge range of arts and crafts supplies at Babipur and the code BUDDY will get you 10% off. They make perfect stocking fillers too! Looks like he had loads of fun! I’ve got a garden play dough one planned once the growing season is upon us again – herbs offer so much to sensory play! My son used to put together sensory boards for little ones. They had to be used multiple times so he couldn’t use fresh items like you have, what a treat. You would not believe the stuff I found in my spice cabinet when I cleaned it out. I had things in there from the 80″s!